The significantly improved and expanded second edition is based on WebLogic 12.1.2 and contains more than 130 additional pages, half a dozen new webcasts and more than 16 new or rewritten recipes. Published May 1st 2014. 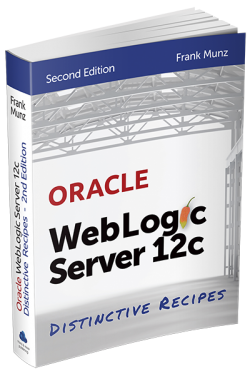 Oracle WebLogic Server 12c – Distinctive Recipes release date was January 9, 2013. There are over 40 webcasts available for free so make sure to subscribe to receive all updates. Imagine you need to know about a problem with your car’s engine. You could plough through the 1000-page manual. Or you could chat to the mechanic over a cup of coffee. That’s WebLogic 12c Distinctive Recipes. It’s WebLogic for software architects, administrators and developers. For people like you who know quite a bit about WebLogic, want to know more, but don’t want the typical ‘recipe book’ full of screenshots. What you really want are the things you won’t find in the manual, like recommendations, discussions, best practices, deployable projects, webcast videos and directions on when to use a feature – and when not to. With all this and more, this book is the perfect complement to official courses and manuals. In short, this gem of a book is almost as good as attending one of Frank’s renowned workshops. This new book is an anthology of best practice in administrating WebLogic, large-scale deployments, performance-tuning biggest mistakes and tools, the merged JVM, using JMX with your own applications, stuck threads, JDBC myths, effectively detecting memory leaks, Java EE examples (deployments and NetBeans projects), Oracle Fusion Middleware (Service Bus, SOA Suite etc.) and WebLogic in the Cloud without the hype. Subscribe to the WebLogic 12c book Youtube channel right now. More videos to come every week! This book comes with an opinion and directions. It’s putting features into a real-world context. You may disagree. Let me know! I will be publishing a lot of the book’s content in my blog upfront. So come back in a few days days or save that RSS feed of the munz & more blog right now. 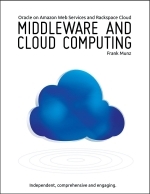 In the meantime sit back and get a copy of my Oracle Middleware and Cloud Computing book if you are interested. 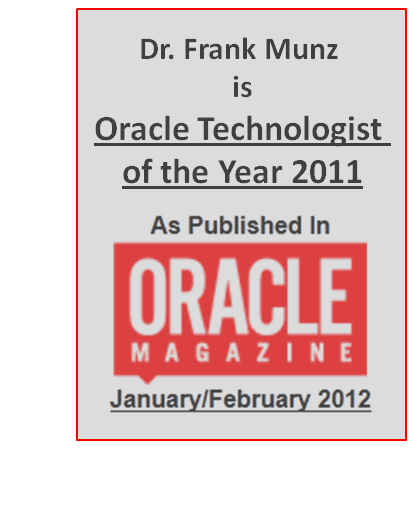 There is a teaser below for my WebLogic 12c book. Switch Youtube to full screen and HD. And only take the ride if you are not getting seasick easily… http://www.youtube.com/watch?feature=player_embedded&v=CUR0cK8WTVc#t=1s Also join the WebLogic Server 12c book on Facebook for comments, encouragement and further information. 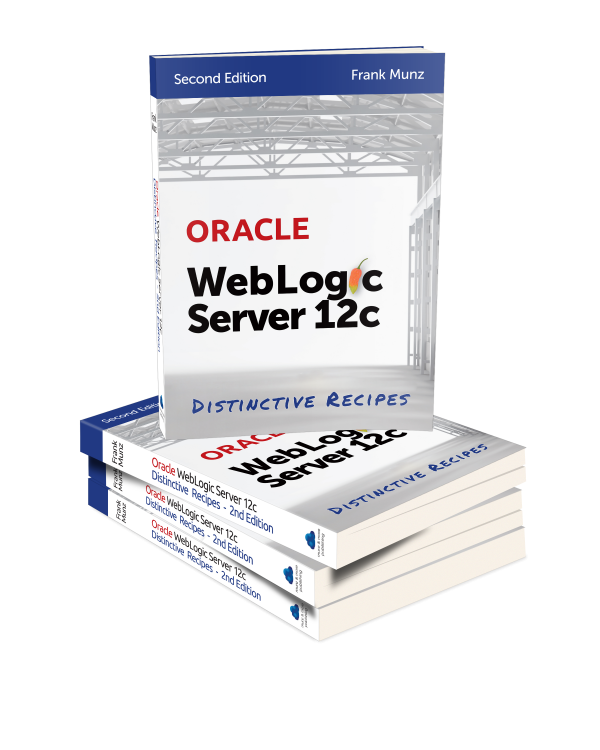 Amazon has heaps of Oracle WebLogic Server 12c: Distinctive Recipes books. All the other distribution channels will follow shortly. Links used in WebLogic 12c Distinctive Recipes. I am currently compiling an errata – please stay tuned.